Yeah, no. Voting based on issues is not running from the debate. 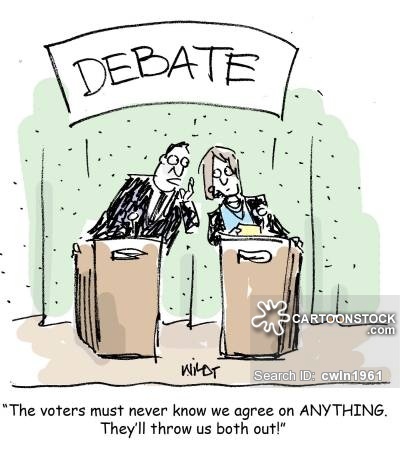 Voting based on party is running from the debate. What's called debate when both sides are inflexible is just people yelling at each other and practicing obstruction. Trying to force views on everyone is not debate. Only with compromise do problems get solved. Sticking with a single all encompassing ideology is what both sides are doing now, with only we moderates and independents casting the deciding votes. Perhaps we have a differing opinion on the meaning of being moderate. In my world it simply means open to all idea's and not in the pocket of a party and their platform. Lord help us all if either party actually gets complete control. Party allegiance—any group allegiance— is horrific. We can see where that eventually leads. I understand that concern. But the parties will be defined by those who participate in them, not by those who refuse to. It's sort of self-defeating in my eyes. Actually, my point is that moderates want to police the debate and try to make those engaged in it look silly (or at least try to). It's not me that's butthurt. It's you guys. This thread is an example. Dude, I said on the first page I don't care if you give moderates hell, both sides do it regularly. We were calling you out for changing the argument, redefining words, and moving goalposts. If anything, you left a bad taste in people's mouth for partisan politics. You'd gladly take an extreme side and keep the status quo, because you think people who make up their minds for themselves rather than have their leaders do it for them is annoying. Eta: you did moderates a favor, so thank you sir. Tell that to Ron Paul and Bernie Sanders. Now that's a point I can agree with in part. The problem being that constituents have no real control anymore, hence the need for Independents willing to cross party lines based on issues. Change is no longer possible from within, you have to be outside of a party to force them to change to get your vote. I've watched the parties flip flop over the years, but not because it's the right thing, it's because of vote pandering. Partisan votes are meaningless since they are predictable and reliable. They want my vote they need to prove to me they are capable of leading and part of that is the ability to work towards compromise for the greater good. Something entirely lacking in the last election. Look at which Presidents made change for the good. JFK, Reagan and Bill Clinton to a lesser degree. They did it by compromising and remaining moderate. I never changed the argument. In fact almost quoted it verbatim in the post you replied to. Of course, as I anticipated, you called out my rhetoric, which is exactly what Stewart did. It’s exactly what the moderates did to MLK. People also make up their minds for themselves when they choose to vote, when they choose a party, and besides I never said nor implied “people who make up their minds for themselves” is annoying. If you think criticism is a favor you might be a glutton for punishment.